is intended for managing data of Active Directory database user profiles. SharePoint AD User Profile Synchronization Service is a web part for SharePoint 2019, 2016, 2013, 2010 and 2007 that allows managing user profile data of Active Directory database users. 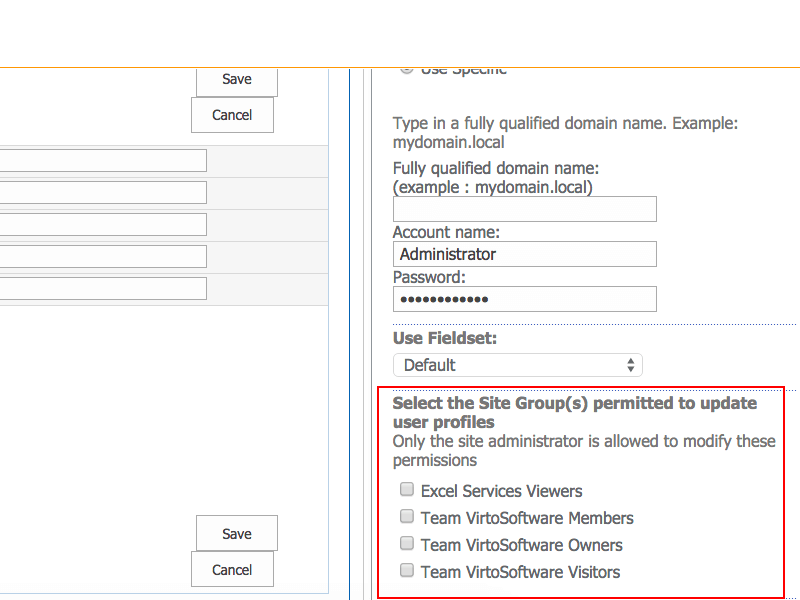 User Profile Service is a part of Virto SharePoint Administration Suite and includes two components – Self Service (for working with your own data) and User Service (for management of other users’ profile data). Being combined in a single solution, these two web-parts provide users with powerful tools for synchronization and editing Active Directory User Profile, while logged into SharePoint Site. Any authorized SharePoint user with the help of AD User Self Service web part can quickly change his personal information in the user profile. The web part shortens the time of system administrators, which they usually spend on users' data management. With User Profile Service, you can define which data will be available for editing. For instance, you can allow the HR manager to change posts of other users, but personal data will be unavailable to edit. User Profile Synchronization Service Web Part supports the following Fields Modes: “Edit”, “Read Only”, and “Don't Show”. You can place fields into four tabs and define fields order. The web part can be adjusted by SharePoint administrator, who decides which users will have permission to manage other users’ data or hide fields from certain users. AD User Profile Synchronization Service Web Part enables users to manage their AD profiles by themselves. Any authorized SharePoint user, with the help of this web part, can quickly change his mobile phone number; add date of birth, car number, and any other data to his profile. This solution enables shortening time system administrators usually spend on users' profiles data management. 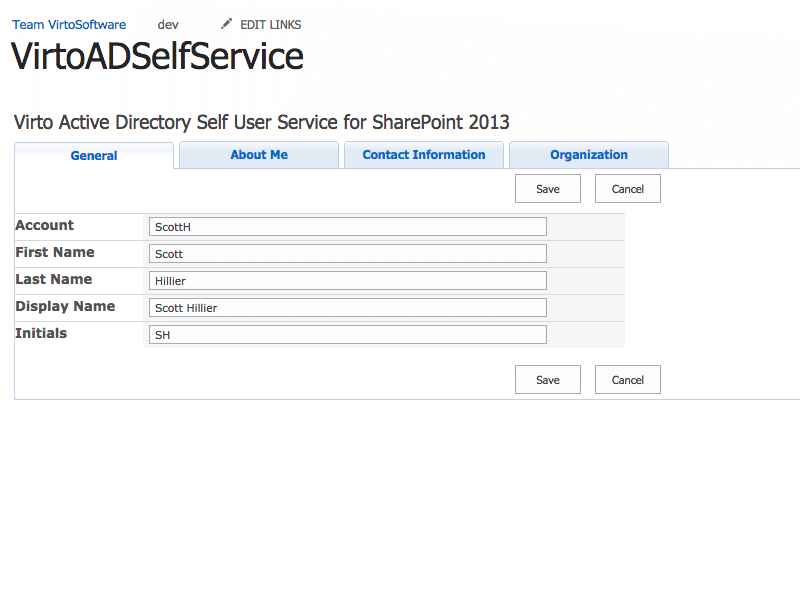 With User Profile Synchronization Service, you can collect information from Active Directory for current SharePoint user, display this data on a site page, allow users to edit the information, and save these changes in the AD. The permissions to change field values' is defined by the administrator (“Edit”, “Read Only”, and “Don't Show”). With the help of the User Service component, you can manage not only your profile, but other users' data as well (if it is allowed by the system security settings). An administrator can set the fields available for editing and hide fields for other users. For instance, you can allow the HR manager to change posts of other users, but personal data (first and last names) will be unavailable for editing. All Active Directory users can be displayed as a list sorted in alphabetical order. It is also possible to find any user with search tools. SharePoint User Profile Synchronization Service enables to view user profiles in a special interface, where all the data is grouped by type (personal data, job details, contact information etc.). After both AD web parts are added to a site, authorized users can change User Profile Info data, and all changes will be transferred to Active Directory, and from Active Directory Data Base — to SharePoint User Profile Records. 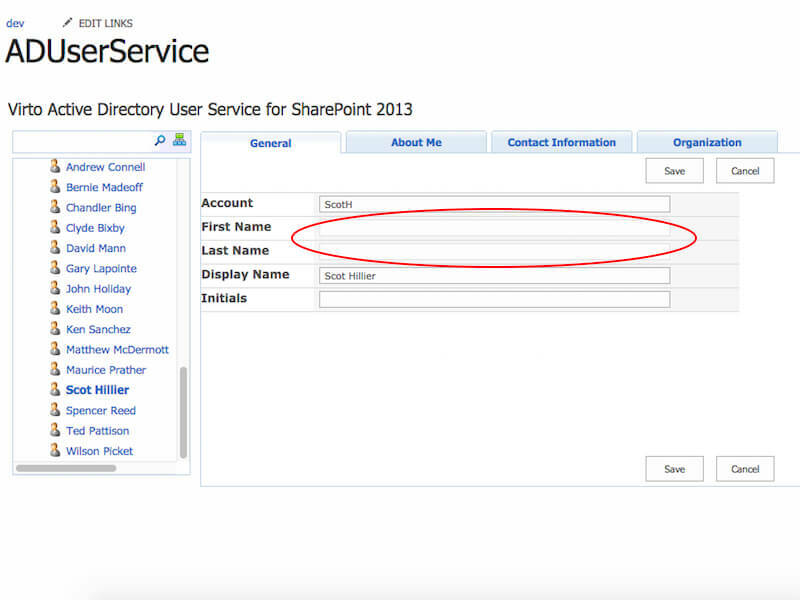 When a SharePoint user logs in, the SharePoint AD User Profile Synchronization Service defines login user and domain, transfers his information from Active Directory to SharePoint and displays it on the page. According to the settings defined for web part users by the administrator, a user can edit displayed information. In this case, the changes will be sent to the Active Directory and the message about successful operation will be displayed. User Profile Synchronization Service Web Part for SharePoint is designed for SharePoint 2016, 2013, 2010, and 2007. Customization of User Profile Fields There is no need to fill out every existing field in the web part – the administrator chooses necessary fields for editing. 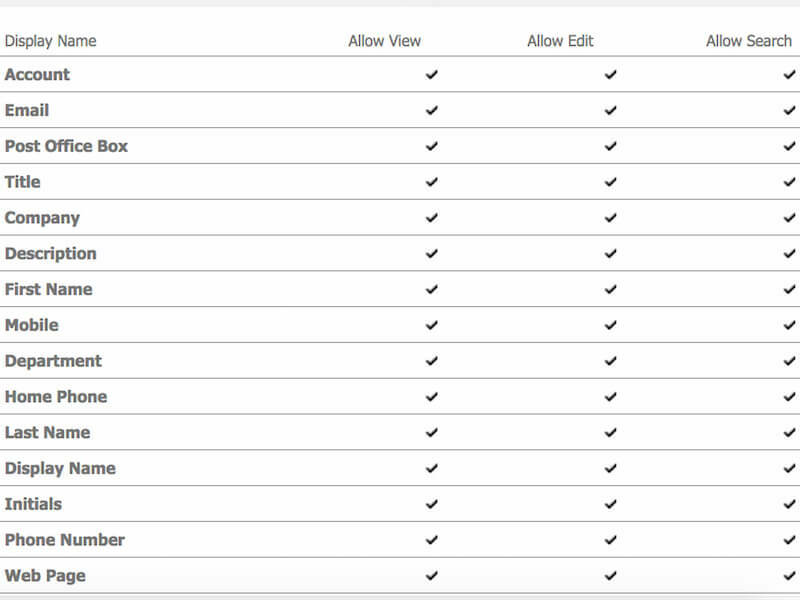 The administrator can adjust different options of editing/viewing/searching settings for fields A security feature that allows making certain fields read-only or invisible for users. Lookup fields are supported Add lookup fields to any user profile. List View of Active Directory User Profiles Users can be displayed as a list sorted in alphabetical order. Ability to search users by AD profile data If Active Directory contains a great amount of data, you can search user profiles by parts of e-mail, city, department, etc. Ability to create tabs in a user profile Site administrator can choose and add fields to different tabs in a user profile. Ability to display users from specified AD Organizational Units For example, you can display users from the marketing department only. 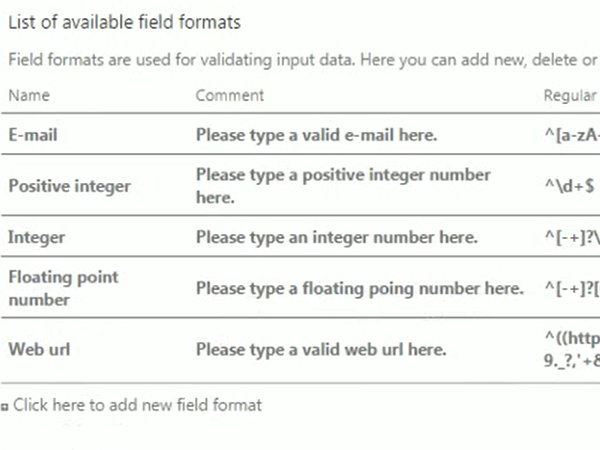 Input data validation Validation format of e-mail, phone number, URL, or other data can be added. Empty values can be also checked. Multiple values in AD field If a user has several e-mails or phone numbers, you can add multiple values to the AD field (if this AD field supports multiple values). Easy way to manage SharePoint Active directory user profiles, the web part worked well right from the start and has everything that is needed! Powerful enough web part. Very easy to change data in sharepoint user profile. I like this product - very useful and easy to use.